This concert was sold out weeks in advance and was an extremely highly anticipated date in the Bournemouth BIC calendar. It followed the late October launch of the album Life, Culture Club’s first record in almost 20 years, after 1999’s Don’t Mind If I do. It also comes years after the band’s latest reformation in 2014. In that year, both a new tour and album were announced, with the band recording 18 tracks for what was to be called Tribes. Not only did that alum never materialise, but the tour was cancelled after frontman Boy George developed a serious throat condition, amid rumoured tensions behind the scenes. It took the band until 2016 to advise that Tribes would never see the light of day. Life now arrives as a kind of belated apology to fans. The audience mix was diverse and it was clear that everyone was hugely excited to see Boy George and Culture Club on stage, with many sporting Boy George hats with threaded hair extensions. Nostalgia was certainly in the air! Fans were not to be disappointed. Right from the first note, the audience were gripped, with opening songs such as ‘Let Someone Love You’ and ‘God & Love’ from Life belted out. Decades might have passed since Boy George’s rise to fame but his voice was just as rich, strong and impressive. His performance was ever flambouyant and playful. There was a fantastic arrangement of tracks – a mix of old songs, many with a twist, and songs from new album Life, which is dominated by appealing reggae and soul sounds. A mention has to be made of the stage graphics which were colourful, vibrant, at times edgy and added a certain glamour to the show. The audience were on their feet right from the start until the closing song, with much singing along to firm classics such as Everything I Own, It’s a Miracle, Do You Really Want to Hurt Me and of course the closing song Karma Chameleon, which brought the house down! Boy George talked about his musical influences in the 70’s and sang the David Bowie classic, Let’s Dance. 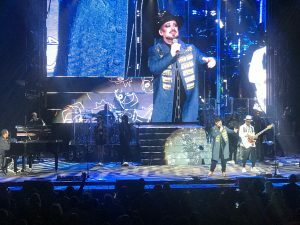 His humour was evident as he described his voice, after 4 consecutive nights of concerts, as being ‘a dash of Bonnie Tyler, Elvis Presley and Rod Stewart!’ I think it’s fair to say that Boy George is an icon of his generation. A hugely enjoyable evening and we’d definitely go back for more!